After a dreadful drive down, I’m back in my Happy Place, a few kilometres from the bottom of Africa. The traffic was awful – much worse than one would expect for a mid-morning on a public holiday – but on the plus side, we only nearly died twice. That’s the driving done for the day though, so the first beer has been successfully partaken off, and a wander along the local beach beckons. Later, unaffected by the loadshedding, we’ll braai and drink red wine and eat chocolate. And then tomorrow, a mini road trip around the Agulhas Plain and off towards Elim. But more of that then. Right now, there’s a beach calling my name. There’s no doubting that SA is in a bad place at the moment regarding its power supply. Years of corruption, mismanagement and poor maintenance have left us in a deep hole. What I didn’t know was quite how deep. Fortunately(? ), expert Chris Yelland has now filled us all in. Both HVDC lines (1420 km, total capacity 1400 MW) from the Cahora Bassa hydro plant between Tsongo substation in Mozambique & Apollo substation in Gauteng are down due to the tropical cyclone. Damaged lines inaccessible, Extent of damage unknown. Time to restore lines unknown. Oh dear. About as bad as it could get then. Chris has also come up with a 6 point plan to try to help us climb out of the hole: click here for curated thread, which no-one with any authority will pay any attention to. This attitude is at least some of the reason we’re in this mess already. 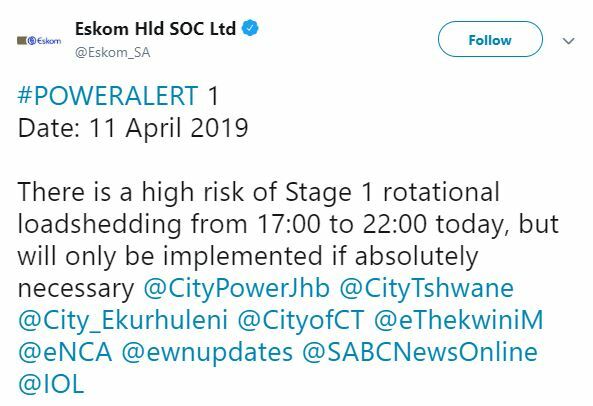 After the near countless allegations of nepotism, corruption, fraud and general mismanagement at Eskom, resulting in widespread loadshedding across the country, you’d think that things really couldn’t get any worse. But you’d be wrong, because it turns out that even when they do manage to supply us with electricity, that electricity is often of very poor quality. It seems that the coal and the diesel that our national power utility has been using is substandard, and thus the electricity it produces is not up to much either. Customers have reported devices running slowly, fridges not cooling properly and – in some extreme cases – power cords becoming clogged with “dirty electrons”. While the principle of generating electricity by burning fossil fuels is fairly straightforward, the actual logistics and processes carried out in the power stations are more complicated and require a decent understanding of chemistry and physics. It’s probably a little beyond the average guy on the street, but basically as far as I understand it, the electricity we use is a flow of sub-atomic particles called electrons. Usually, an electron would carry a charge of -1, but because of the poor quality fuels being burned to produce our power, many of the electrons being produced in Mpumalanga and surrounds only have a charge of -0.8, and in one particular case recently in Ceres in the Western Cape, as low as -0.6, which caused TVs in the town to run in slow motion. The sad fact is that the coal and diesel stockpiled for emergency use during these (often quite literally) dark times is all likely to be from the same batches, and so even though we might be getting electricity some of the time, it’s probably not going to be up to much. There’s not much you can do to escape this poor quality electricity, save from giving your cables a good shake every couple of days to hopefully dislodge any build-up of sticky electrons before they get too clogged up. So just another thing to remember. Oh, and be mindful that smaller wires, like those in cellphone chargers, are particularly at risk. There’s no quick fix here, folks. Much like Eskom in general. Much like the ANC. Sadly, we’re all going to have to get used to turning our fridges up and running Youtube videos at 1.25x speed until this passes. Have you experienced problems with “dirty” electricity recently? Or do you have ideas to combat the damage it may do? Please comment below. Like a poor sequel, loadshedding (you may remember it from such terms as “Rolling Blackouts”) has returned, and once again, we are regularly being plunged into darkness. Being plunged into darkness is never good at the best of times, but if you don’t know that it’s coming, it can be particularly irritating. So, best that you know when it’s coming then, and we’re here to help. The good news for those of us in Cape Town is that some degree of loadshedding is often mitigated by our spare generation capacity (the hydroelectric unit up at Steenbras). If you’re going to work out when and how much you’re going to be loadshod, you need a few bits of information. First off, you need to know whether you are supplied by the City or by Eskom and you need to know what stage loadshedding we are on. To see what stage the local loadshedding is on, check this page. To check for who your supplier is, look at the map here. If you’re not in one of the cheerfully coloured areas, you’re an Eskom customer, and you should go here to view the appropriate schedules. If you are in one of the cheerfully coloured areas, look at which one and then head here to see when you’re going to be cut off. And that’s it. Loadshedding isn’t an exact science, so no promises made as to what might actually happen on the ground at the time, but this is as good a guideline as you’re going to get. Loadshedding should last for about 2½ hours a pop. If it goes on much longer than that something has gone wrong (or it wasn’t loadshedding in the first place – other electrical problems are also possible), talk to the City on 0860 103 089 or Eskom on 086 00 37566. Don’t forget to not tell them where you live. That’s always helps. Khulu Phasiwe twitter – Eskom spokesperson – DO NOT SHOOT THE MESSENGER.